Guantanamo Bay in Cuba is most well-known for being the home of a very controversial detention camp that houses foreign prisoners and run by the United States government. The bay is also home to thousands of workers and contractors, most of whom are from the Philippines and nearby Jamaica. They do the majority of the menial jobs in Gitmo. They work as builders, technicians, store keepers, restaurant cooks, drivers, and janitors. In an article he penned for Newsweek in 2014, the American journalist Alexander Nazaryan observed that majority of the 2,000 laborers working in Guantanamo Bay are Jamaican and Filipino. Nazaryan also noted that on Friday nights, the beach would come alive with the sound of music coming from the Filipino population's "quite lively karaoke parties". Latest data show that the bay currently has a population of around 6,000. More than a thousand of them are Filipino workers. Many of them have been working and living in Gitmo for long periods of time. Some have been there for over 10 years. The first wave of Filipino workers started trooping to the place in 1959. That's about the time when diplomatic relations between Cuba and the United States were severed. 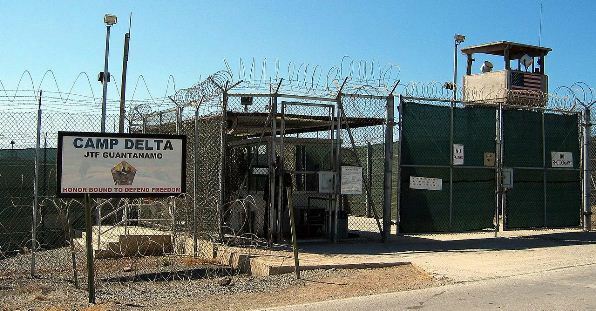 Most of the prison cells in Gitmo that started housing alleged terrorists and Al Qaeda operatives in 2002 were built by Filipino welders, fabricators, and carpenters. The conditions of workers in the camp have been criticized by some journalists and human rights advocates. In her book Guantanamo: A Working Class-History Between Empire And Revolution which was published in 2008, Jana Lipman shed light on some of the problems that Filipinos and other workers encounter in Gitmo. "Today, the international map of imperial power is far more circuitous than the social milieu of Guantanamo. Angelo dela Cruz was only one of thousands of Filipinos hoping to earn higher-than-average wages in the War on Terror. And so perhaps it is not shocking that in 2002, Filipinos built the prisons that first held the alleged Al Qaeda detainees on GTMO. They worked for a subcontracting firm with ties to KBR, and their grueling work schedule entailed twelve-hour days, seven days a week. They earned approximately nine hundred dollars a month, plus access to specially imported foods, such as tilapia, ginger, and fish sauce. Filipinos built the high-tech prisons, but they were also confined to isolated quarters. One worker, Jojo, vented, "Aside from the good food and pay, we lived like prisoners - we had our own guards and could not leave our compound." On completion, the Filipino workers flew from GTMO to Jamaica to Miami to San Francisco, where they were constantly under surveillance, not even able to visit the restroom alone. One frustrated worker asked, "Why are you doing this to us, keeping us like prisoners? You should treat us better. We were the ones who built the prisons of your enemy."